Shame on those of us who saw Scott Dixon disappear into a cloud of dust on Lap 1 of the Portland Grand Prix and thought his race was over. How foolish. How absurd. After all, even casual followers should know Dixon is IndyCar’s MacGyver — able to escape seemingly any situation, even when it looks dire. Dixon somehow — improbably, incredibly — salvaged a fifth-place finish on Sunday when his day looked screwed from the start. Not only that, he took advantage of untimely cautions and misplayed strategy that affected fellow title contender Alexander Rossi, allowing Dixon to actually extend his lead by three points — to 29 overall — going into the season finale. These are the kind of things that only seem to happen to Dixon. If you described such a scenario to someone in IndyCar and didn’t attach a name, everyone would know you were referring to the driver of the No. 9 car. Drivers predicted a sketchy start to the race all week, and that’s exactly what happened. As part of a multi-car wreck on Lap 1, Dixon was shoved into the dirt and felt a significant impact — though he couldn’t see what he hit. “I felt like I wanted to cry,” Dixon said of sitting there while the dust cleared. He didn’t expect his left front wheel would still be attached when his vision returned, but there it was. And as it turned out, Dixon had the presence of mind to pull the clutch while the crash was occurring — allowing him to keep the engine fired. While others left on a hook, Dixon somehow put it in reverse, told the safety truck to move and drove away. But that wasn’t immediately evident, because he was tagged for a speeding penalty midway through his comeback and saw all the gains erased. Again, though, it’s foolish to count out Scott Dixon. So when his team stuck to a two-stop strategy (the same as race winner Takuma Sato) and Rossi made three, Dixon got the track position needed to extend his points lead. Meanwhile, Rossi looked a bit stunned in the aftermath of his good day gone bad. He had a faster car than Dixon, but was done in by circumstances not of his own doing. Rossi quickly dismissed the suggestion the damage was minimized by losing only three points to Dixon heading into Sonoma. Season of Rossi: Can Alexander cap roller-coaster campaign with title? 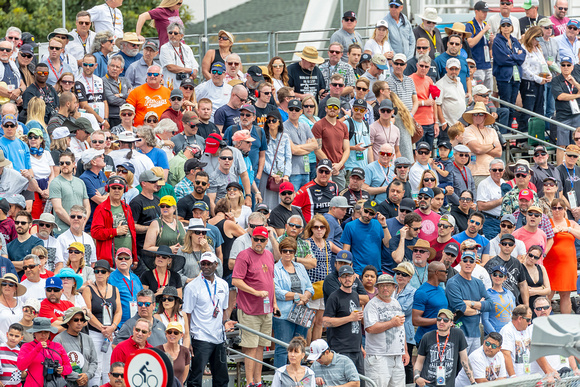 As an unexpectedly large crowd lined up for Friday’s IndyCar autograph session at Portland International Raceway, one of the first people in line to get Alexander Rossi’s signature was a young boy wearing NAPA gear. It’s something Rossi has noticed more lately now that he’s frequently been in the spotlight — for various reasons. If you’re a fan of Rossi, it’s more likely to be based off his racing style than his personality. That’s not to say he lacks in the personality department; heck, he competed on a reality TV show and co-hosts a podcast, so that’s clearly not the case. But the self-described introvert does most of his talking on the track, where his no-apologies driving style, balls-out racing ability and eye-opening talent have made people sit up and pay attention more than ever this season. Rossi’s moves can be controversial at times — depending on your view — but you can’t accuse him of settling for anything. Winning the 100th running of the Indy 500 two years ago was a major accomplishment. But given it happened nearly right away in his IndyCar career and he was a virtual unknown to many American race fans at the time, it wasn’t something that launched him into stardom by itself. But now, having found his rhythm with three victories in 2018 — after winning twice in his first two years combined — Rossi is on track to becoming one of IndyCar’s biggest stars. It wasn’t always that way, because IndyCar was never the goal for Rossi. He chased Formula One dreams and ultimately made starts in five F1 races. But his home ultimately became IndyCar after getting an opportunity with Andretti Autosport. These days, he’s hoping to be the next American who could carry the banner as a champion in the United States’ biggest open-wheel series — one year after Josef Newgarden did the same. “I think it’s massive for the series (to have an American champion),” Rossi said. “(As) Americans, it’s hard to cheer for the French guy or an Australian guy. As much as we love them and respect them and admire what they do, Americans are patriotic people, right? If he pulls it off, he’ll have completed an impressive comeback. After the Toronto race on July 15, Rossi was third in the point standings — 70 points behind four-time champion Scott Dixon. Three podium finishes later (two wins and a runnerup finish last week at Gateway), Rossi is down by just 26 points with two races to go. Oh, and the season finale at Sonoma? It’s a double points race. 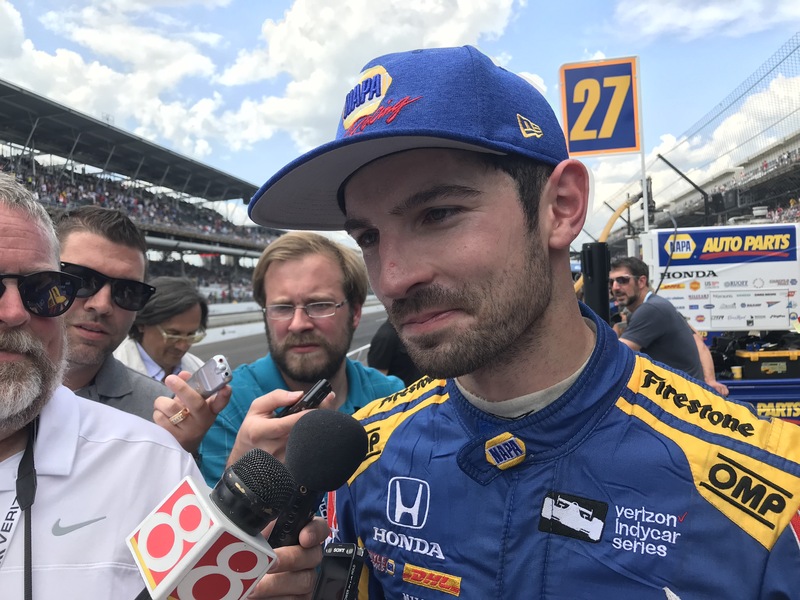 Alexander Rossi kept saying he was disappointed not to win the Indianapolis 500 after finishing fourth on Sunday — and no doubt, that’s true. But he could barely hide a smile while surrounded by reporters on pit road after the race, because Rossi knew he just did something pretty cool. After starting 32nd — second to last — on the most difficult passing day in the last half-dozen years at Indy, Rossi nearly ended up on the podium. And he seemed to will himself to the front thanks to gasp-inducing moves on multiple restarts, where he improbably made the outside lane work. Come on, though! Other drivers weren’t making those type of moves work — or even daring to try them, seemingly. Rossi did, and put on the most memorable show of the Indy 500 despite losing out to Will Power. They did. It’s fitting Rossi was accompanied Sunday by several of his fellow contestants from last season of The Amazing Race — winners Jessica Graf and Cody Nickson, along with Kristi Leskinen (Team Extreme) — because that was certainly a fitting description for how he drove. Leskinen snapped photos of the media mob surrounding Rossi on pit road to ask him about his feat. When Rossi was asked about his level of confidence in making those moves, he basically gave a verbal shrug. Never, really. Unless it’s a bad day. And then I don’t think it’s dreams, it’s just not being able to sleep — because you’re constantly replaying what happened and what went wrong. But I never have the good dreams about racing. I don’t think so. The result is what it is. I think if it’s someone you have a good relationship with off-track, you’ll probably talk to them. But if you don’t, then no. The biggest compliment someone could give me is probably that you’re a good racing driver but also a good person. As much as we define ourselves as race car drivers, outside of that we’re just normal people and human beings who are trying to do good things in the world. You didn’t have to think about that for very long. Nope. Deadpool. He’s pretty cool. I don’t know that it’s a big enough advantage to go vegan, so I would not do it. I like meat — I eat meat pretty much every day, so I don’t think I could give that up. Conor (Daly) would. Conor is a part-time vegan. So I think he’d probably be the first to go for that. 6. It’s time for the Random Race Challenge. I have picked a random race from your career and you have to guess where you finished. This is the 2015 Formula One Mexico Grand Prix. Do you remember where you ended up? That is correct! Are you good at remembering races? I’m pretty good at remembering races, yeah. That one I wasn’t as sure of as other ones, but obviously I had a pretty good idea. What were those days in F1 like for you? Awesome. I mean, that was my dream. That was what I had worked to do for 15 years. The fact I finally got the opportunity to be a Grand Prix driver — although it was only for five races — was pretty special. Regardless of the fact we didn’t have a competitive car to win races, that was a dream come true for me. I’ll definitely cherish those memories. I have a lot of respect for Jay-Z, so we’ll go with him. Just him as a businessman in general. Beyond his rapping, just him as a brand is pretty amazing. It’s something I think a lot of people can aspire to be like him. That’s a mean question. We’ll go with Charlie (Kimball). Just because of his face, or do you actually want to punch him? I don’t want to punch Charlie. He’s just got that look about him. 9. IndyCar enlists three famous Americans to be involved with your team for one race as part of a publicity push: Taylor Swift, LeBron James and Tom Hanks. Choose one to be your strategist, one to be your spotter and one to be your motorhome driver. Well, I feel like Tom Hanks should be the spotter because he’d be the most analytical. Considering the relationship you have with (spotters), you’re kind of putting your life in their hands in a remote way. Then LeBron is going to be a better strategist than Taylor Swift, and I also think it would be pretty cool to talk to him during a race. He’s the one you’re bouncing ideas off of, so that’d be great. He’s the king. Then that leaves Taylor as a motorhome driver, which would mean my motorhome didn’t get anywhere, I don’t think. I wouldn’t imagine she’s that good at that — she might be! That might be very prejudiced and rude. She might be an excellent driver. But I feel like she doesn’t drive a lot of places — I feel like she gets driven. And hey, when you’re that level, you should (get driven). I don’t know there’s a key, but it’s definitely something we all scout out. And of all places for there not to be an abundance of bathrooms, it’s the Indy Motor Speedway — which I think is ridiculous. There’s as much as a panic to get to the restroom before the national anthem for the 500 as there is a panic getting into Turn 1 on Lap 1 of the 500. Like it’s ridiculous. I don’t understand how they think it’s OK to have the highest-attended race in the world and have like four bathrooms. Boggles my mind. 11. Carl Edwards used to do backflips when he won a NASCAR race, and IndyCar decides it wants something similar. How much money would they have to pay you to backflip off your car after your next win? We also have a lot less height to start that from (than NASCAR cars). I don’t think anybody is going to be able to pull that off. …from the ground. Which none of us are doing. That’s a great question. It’s both. With the downforce on a high-speed corner, it’s more about who is willing to muscle it though the most. Even though there’s a lot of downforce, the car is sliding and moving around a lot. So it kind of rewards bravery and commitment. But then the slower speed corners, because there’s a lot of downforce, it’s also drag. We don’t have a huge amount of horsepower for the amount of downforce/drag we create. So you’ve got to be pretty precise with it in order to get the power down quickly and extend your full throttle time. It’s a tale of two worlds. I would say it’s more finesse required on a street circuit versus a short oval or a road course. The next interview I’m doing is with a yet-to-be-determined NASCAR driver. Do you have a question I can ask him? What is your opinion of Danica? Oh man. I would love to know this. 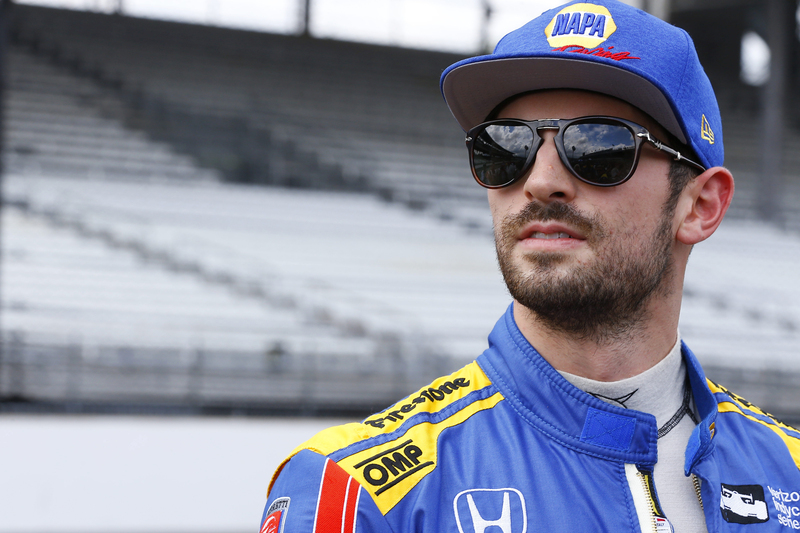 Alexander Rossi lost control of his car and took out Robert Wickens on the final restart of the IndyCar season opener in St. Petersburg two weeks ago, sparking an ongoing debate about the move. The two friends moved on quickly — they were at the gym working out together 48 hours later, Rossi said. But even then, the controversy over Rossi’s attempted pass was still raging online. And as Rossi sees it, that’s a pretty damn good thing. There hasn’t been a race since then, and it will be two more weeks until the series returns to action at Phoenix. But if IndyCar can manage to keep its positive momentum going for that long, the series appears to be off to another promising start. IndyCar has been on an upward climb of late. In the last year, Fernando Alonso left the biggest Formula One race of the season to drive in the Indy 500, IndyCar got a refreshing young American champion in Josef Newgarden after a close points battle, the series brought a redesigned car to the track, had two drivers shine on The Amazing Race during the offseason and this week announced a new TV deal with NBC Sports. If that’s not enough, Rossi’s incident with Wickens — one of several promising rookies as part of IndyCar’s youth movement — put the focus firmly on the racing action to start the year. With nearly two weeks to reflect on what happened, Rossi has the same stance he did in the moments after the race: He saw a chance to win the race and went for it. Unfortunately, his car slid in the marbles and sent Wickens into the wall. Rossi called it a “misconception” he had any intention of taking Wickens out. “I don’t think people really understand,” he said. “It’s probably silly to admit this, but we don’t have as much control as fans would actually think. Like I can’t control a rear slide to be 30 degrees and just hit someone at a certain point to not damage my car but hit them enough to spin them out. That’s not a calculated thing to happen. The good news in circumstances like that? There’s a chance to see the same two drivers battle again in a similar scenario. The next street course race is in three weeks at the Long Beach Grand Prix, which Rossi was promoting in Los Angeles on Wednesday. Speaking of an amazing race, Rossi’s deep run on the CBS hit reality show with Conor Daly (they made it to the season finale before getting eliminated) is something he doesn’t mind discussing. After all, he went on the show to help promote IndyCar. And he hopes it worked. So far, he hasn’t been recognized as a direct result of the show (a woman who spotted him at the Toronto airport was the only one he could think of). But winners Cody Nickson and Jessica Graf were at the recent IndyCar test in Phoenix and plan to come to the Indy 500, along with Team Extreme’s Kristi Leskinen and Jen Hudak.